As some of you may know, I have yet to become a part of the iOS/Android crew. I think my lack of an Instagram account and various updates on what I ate and what my make-up is for the day already suggests that ;) However, I may eventually bite into it and get one for myself some time in the near future. Its batteries will probably be drained all the time from all the apps I'll be installing on it. I already drain my current phone's batteries given the limited apps available to it, what more when I switch to iOS or Android? For sure I'll have my face stuck to my phone playing games all day. One game I'm kind of excited about getting is EnviroPOP. It is a puzzle application wherein you have to basically rescue endangered species from a host of sea hazards. I'm all for puzzles like these because I find time-pressured games very addictive and a great way to let time pass. 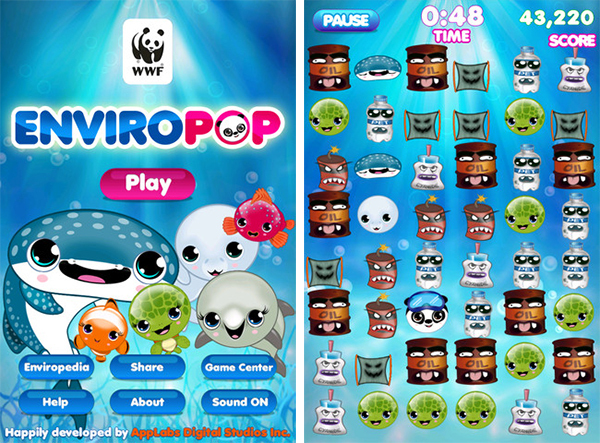 Aside from that, EnviroPOP is actually a collaboration between World Wide Fund for Nature (WWF-Philippines) and AppLabs Digital Studios, which means that you also get to donate to WWF-Philippines' marine conservation programs just by downloading the full version (lite version is free). Yup, all $.099 goes straight to preserving marine life! For less than PhP 50, you can have fun for a good cause. I also heard that one of its cast and crew is a character called "Chi-Chi the Panda"--UH, OKAY. I'M SOLD. Anything with a panda on it and I'm in. This is definitely going into my Apps to download list once I finally get a new phone. Share with me your fave apps of the moment? Thank you, Casper&Pearl! I would love to wear one too one day :) Hopefully I'll get around to just that!